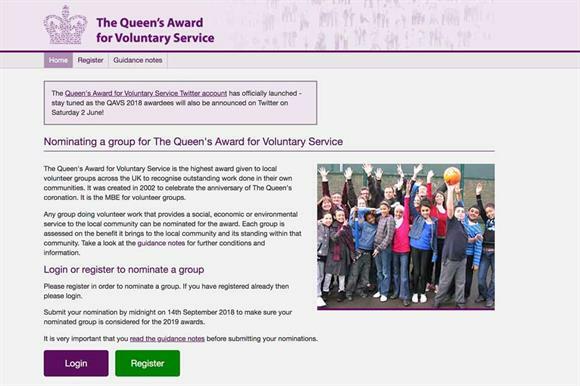 A record 250 voluntary groups have been awarded the Queen's Award for Voluntary Service, the government announced last week. The award, which recognises outstanding contributions to local communities by groups of volunteers, was created to mark the Queen's Golden Jubilee in 2002. The number of recipients has risen sharply in recent years. Last year's 187, the previous record, was 60 per cent up on the 2016 total. More than a tenth of those selected this year are from Greater Manchester, although a spokeswoman for the Department for Digital, Culture, Media & Sport, which announced the awards, said this wasn't linked to the sector's response to last year's bombing at the Manchester Arena, which killed 23 people. The 27 organisations from Greater Manchester include the British Muslim Heritage Centre and the Greater Manchester Police Special Constabulary. Nineteen winners are from Greater London. Just two are from Wales. Successful applicants across the UK range from the County Down Traction Engine Club to the Basingstoke Canal Society. A total of 537 nominations were submitted. After initial local assessment visits, a committee chaired by Sir Martyn Lewis, the former broadcaster and ex-chair of the National Council for Voluntary Organisations, made recommendations to the Queen. Lewis said: "The recipients of the Queen’s Award are at the very top of a formidable volunteering movement in the UK involving millions of our citizens, and going from strength to strength." Tracey Crouch, the Minister for Sport and Civil Society, said in a statement: "The record number of recipients this year is testament to the strength of the voluntary sector, and I am sure this trend will continue into the future. "If you know any organisations that deserve to be recognised, make your voice heard and nominate them for next year." Nominations for the 2019 awards close on 14 September. Volunteer-led groups consisting of two or more people can be nominated. More information is available here.